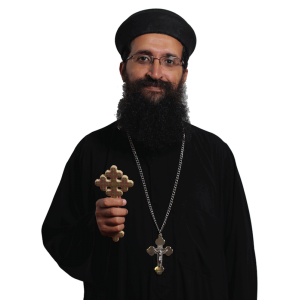 Father Mina Girgis was born in Cairo, Egypt on July 24, 1970. He earned a Bachelor of Arts Degree in Accounting from Ain Shams University in Egypt in 1991. He came to California the same year and worked as an Accountant from 1991-1997. He served as a Deacon and Sunday School Teacher at St. Mary, Cairo, Egypt and at Holy Virgin Mary Church in Los Angeles for about 15 years. In 1997, he became a consecrated Deacon and Secretary to His Grace Bishop Serapion in Los Angeles, who ordained him presbyter on June 10, 2001.